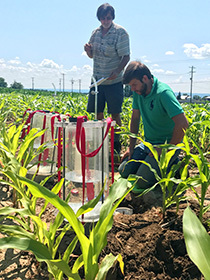 Details of the testing procedures for the individual soil analyses can be found in the Soil Health Assessment section of the Comprehensive Assessment of Soil Health – The Cornell Framework Manual. Read more about add-on tests. NOTE: Due to United States Department of Agriculture, Animal and Plant Health Inspection Service regulations the Cornell Soil Health Laboratory cannot perform the Bean Root Bio-Assay on restricted or quarantined soil. Please follow this link for a list of states and counties that fall under this category.